The purpose of Theatre is to increase students' understanding, appreciation, and critical perceptions of the theatrical event and support the individual students’ artistic vision. Each year, the Gilbert Theatre Ensemble brings together actors and technicians, across multiple grade levels, to create the theatrical experience and motivate and inspire one-another in this collaborative art form. Students are assembled in a stimulating setting of global historical weight and are challenged to deploy their collective experience, knowledge and values to take on the challenge of production – not shying away from any challenge. The agenda of the ensemble is forward-looking, encouraging each other to preempt challenges to theatre by adopting a longer-term perspective. Throughout history, theatres have played host to the biggest debates of the day. And at the theatre, both the actors and the audience create a unique, shared experience. Performance Theatre is comprised of actors and technicians selected by audition and interview. The ensemble is primarily made up of juniors and seniors and they compete state wide at competitions for scholarships and in Individuals Events (I.E.). Performance Theatre studies and performs modern and classical One-Acts, Full Length Plays, and Student Directed Plays. They are the competition team at Gilbert High School, competing in the Arizona State Thespian Festival, Central Acting Festival, and Arizona State Competition. Seniors compete for scholarships in acting and technical theatre. They have won numerous state & national awards and scholarships; e.g., Gold Thespian Honor Troupe 2015-2016, Lighting Quick Hang Challenge 2015, Superiors in the CAAFT & State One-Act, I.E., Monologue, Solo Musical, and Lighting Design. Performance Theatre Arts PA 178. Advanced Theatre is comprised of actors and technicians selected by audition & interview. The ensemble is primarily made up of juniors and seniors with an occasional sophomore. The Advanced Theatre performs Shakespeare material, as well as focuses on developing student-directed productions and the development of modern theatre from the 19th century concept of realism-naturalism through the present movements away from realism through the examination of plays, theories and cultural movements. They tour to local Junior Highs, and learn to become leaders as they better their skills as technicians and actors. Advanced Theatre Arts PA 177. Intermediate Theatre is the second level of theatre at Gilbert where students continue their education of theatre. It is comprised primarily of sophomores. The class also focuses on building good acting techniques and teaching basic technical skills; i.e., the class will focus on the techniques/philosophies of the master teachers of acting, e.g., Uta Hagen, Robert Benedetti, Sanford Meisner, Stella Adler, Lee Strasberg, and the father of “method acting” Constantin Stanislavski. Intermediate Theatre performs twice a year; the 10-Minute Play Festival in the Fall, and the class One-Act in the Spring. We also tour our Reader's Theatre & Puppetry Theatre to Toybox each year. Intermediate Theatre Arts PA 176. Beginning Theatre is the first level of theatre where students are a mix of talents and skill level. It is comprised primarily of freshmen and/or students with limited acting or technical theatre background. The class focuses on building good acting techniques and teaching basic technical theatre theories. This beginning theatre performs twice a year; Fall Pantomime Show and Spring Duo-Scene Show, and attends professional theatre and workshops to improv skills. They perform a wide variety of content both classical and modern. Beginning Theatre Arts PA 175. Intro to Technical Theatre is the intro technical theatre class at Gilbert High School. Students learn the basics of play production, and the fundamentals of stage makeup; equipment and basic application of straight, character, corrective, and 3-D makeup, fundamentals of set construction. Practical experience in building and painting stage scenery. Each student is required to assist with construction of a set. Intro to Technical Theatre PA 180 & Adv. Technical Theatre PA 181. Dr. Angela R. Hines received her B.A. in Theatre, her M.Ed. and M.A.C. in Secondary Education-Theatre Education, and her Ph.D. in Curriculum and Instruction-Curriculum Studies from Arizona State University (ASU). Her Dissertation; The Theatrical Ties that Bind: A Post-Structural Analysis of Theatre Education Programs, was a finalist for dissertation of the year for ABER. In addition to being with Gilbert High School, she is also a Faculty Associate for the Mary Lou Fulton Teachers College at ASU teaching courses in Developmental Psychology. She serves on the Arts-Based Educational Research (ABER) Special Interest Group of the American Educational Research Association (AERA) and the District Oversight Committee (DOC) for Gilbert Public Schools. Her writing on Theatre Education can be viewed in Youth Theatre Journal, Sage and Scholars Press. 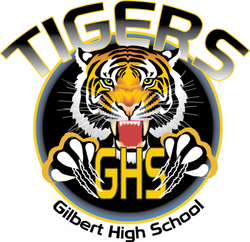 Gilbert High School is dedicated to providing a safe learning environment that engages, challenges, and encourages individuals to achieve their full potential. It is the mission of Gilbert High School to provide a foundation for each student to become a lifelong learner, to be able to meet life's challenges through problem solving and critical thinking processes, to promote development of the whole individual and to provide opportunities for each student to become an articulate and responsible member of a dynamic technological society. The worth and dignity of each individual. The ability of all students to learn. The use of teaching strategies that foster critical thinking, life long learning and responsible citizenship. The development of skills that will enable students to succeed in a global and technological society.